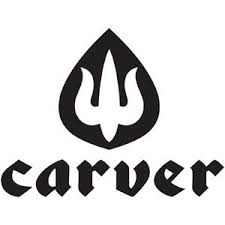 Carver 30" Eggbeater Skateboard Complete is a traditional style surfboard shape on a progressive Carver surf skate board. Shaped after a single fin hull. This pintail shape is short enough to snap quick turns while giving you the stability you need for long flowing carving lines. The rounded, full nose allows you to have a wide stance with your feet rocking over the trucks. The wide stance gives you optimal stability and control. Ideal for going fast or if you just want more control of your board when hitting those hard cut backs. The Eggbeater of course still has a nice kick tail for quick pivot turns or for hopping over cracks and bumps. The Eggbeater is modeled after the older longboard surfboards. Perfect for the old dude trying to up his game or get back in to the surfskate lifestyle. The Eggbeater is a 30" inch long board with a width of 9 3/4" inches. It has a tail of 6 1/8" inches and a nose of 3 1/8" inches. The big soft wheels that come on the Eggbeater provide you with maximum grip and control. These wheels sit at a 16 1/2" inch wheelbase.